Memphis Invest started about 15 years ago, when the real estate market was down and many were not eager to get started with real estate investing. This presented a great opportunity for investors that had income and were risk takers that wanted to get started in turnkey investing. Experts would recommend that you NOT get started in a down market if you do not have additional funds to keep you steady or an exit plan in place in case you can't weather the market and Kent totally agrees with this advice. Kevin mentions how an exit strategy is one of the most important things when investing, and discusses how this can deeply determine your successes and failures. 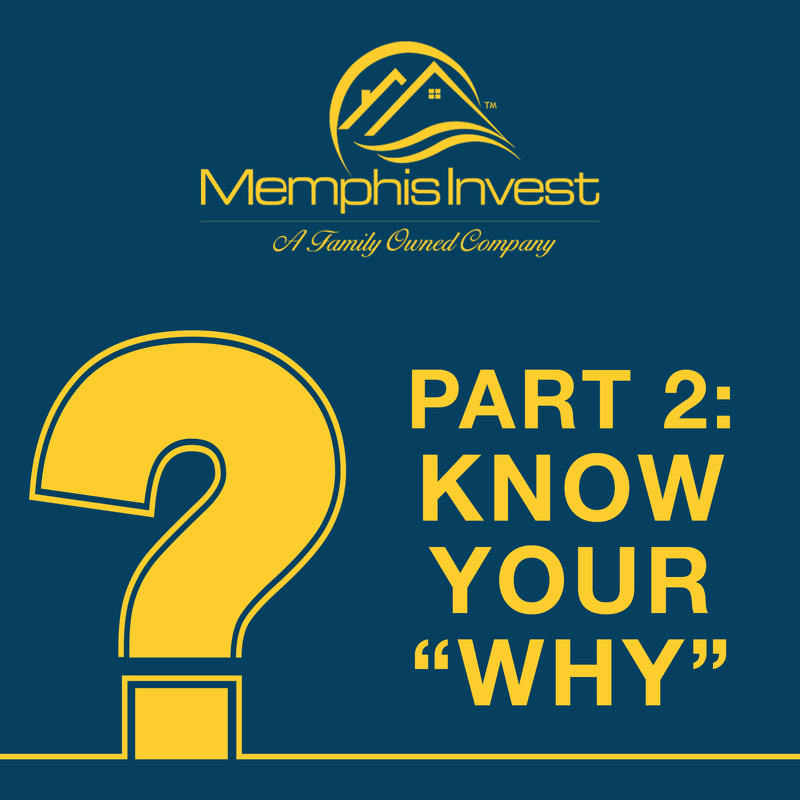 Many of our clients at Memphis Invest have a long term strategy, including preparing finances for the purchase, having a renter pay down the mortgage, using that rent for taxes, paying off the mortgage and for incidentals. Having a turnkey company to help you navigate and help you meet your goals can be your biggest asset. In this episode, Brett also gives some advice for newer investors about choosing your 'why' for investing. Many people who get ambitious and choose real estate as their vehicle for investing will often easily become discouraged or dissatisfied because their goals are unclear and therefore success is even harder to recognize. For example, Brett currently owns 45 properties and his goal is to have those become debt free as soon as possible, as well as to keep purchasing properties to grow his portfolio. He used leverage to get most of these houses, but is using the excess cash flow to pay down the debt much more quickly than riding out a 30 year mortgage. This works for many of our investors, but make sure you find out what works best or you. Whether it's conventional financing or non-recourse lending or cash, there's a strategy that you can set in place from the beginning to help you scale your investment as your portfolio grows. Our licensed portfolio advisors would love to talk more with you about this, click here to schedule a consultation with them! Brett also shares that if he were a first time out of state investor, the first thing he would do is take the time to go to whatever city you're planning on investing in. Make that investment of your time and your money to go and spend time with your boots on the ground. Don't just rely on what other people tell you or what you read on the website. See it for yourself and get a comfort level of the people you're working with, do your due diligence. Do any other type of homework about the property and the area, whether it's taxes, population growth, job growth, etc., these are always factors to consider when starting your investment journey. Bottom line: have a good plan, work with good people. Find out your why, use your resources and do your homework, and make sure you pick the best team to help you reach your goals. After 15 years in the business, Memphis Invest has earned trust, reputation and credibility by protecting our investors and providing excellent customer service. Kent Clothier: Hello, everyone. Kent Clothier Senior, here. Welcome to the Experience Matters podcast. We're going to go Part B today of challenges for real estate investors, Part 2, Part B. Whatever we're going to call it here. It's going to get into some things that we talked about in the previous episode about challenges for today's real estate investor, whether you are owning your company, whether you are going to be doing turn-key properties as passive or an active real estate investor. Again, we want to welcome you today and remind that you can find us on the Memphis Invest dot com website. There, you'll find the video and the audio. Also on the sound could stitcher and iTunes, you will find the Experience Matters podcasts. We are about on episode 28. Today, I think we have over 25,000 views, followers, on our podcast. For that, we thank you very much. We hope that we continue to bring you good content. Today, my guest and hosted by Kevin Hommel, always with us on most of our podcasts. Kevin, are you there today? Kevin Hommel: I'm here. Good afternoon. Kent Clothier: Thank you for joining us today. Kevin Hommel: Glad to be back. Kent Clothier: And then my youngest son, Brett Clothier, that works in Memphis Invest with us. Hello, Brett, thank you for joining us today. Brett Clothier: Good to be here. I got these gentlemen, they're going to help us today kind of go through this second edition of some of the challenges that may be out there for real estate investors. Maybe we can help you through this mine field of things that we've experienced over the last 15 years and make your journey a little bit easier. With that, let me open it up. I got a few little things I want to throw out that I think we need to talk today about a little bit about the timing, a little bit about the location, little bit about your price, little bit about starting a down market, little bit about some basic things like interest rate, insurance, taxes, maintenance, and then helping you to select a turn key passive company if that's what you decide to get into. Again, welcome everybody and let me jump into this. Kevin, you want to kind of get us started here today? Kevin Hommel: It's interesting you said a down market. Probably some people that are listening to this and they don't even know what a down market is because there hasn't been one in so long. The big boom of this business really hit when the market was down and the foundation set for the growth that we've experienced. As far as timing goes, I think where I'd probably start is just opportunity in any market. Maybe that's something the three of us can shed a little light on for the person out there listening that wants to start building a portfolio or add to their existing. Given that we are in a pretty hot market everywhere, we all hope that, obviously, that keeps up. Kent Clothier: That's good. When we started, we actually started in the down market here back 14, 15 years ago. We actually went through the recession market and were able to scale the business, luckily. But the one thing that we didn't have to have when we were doing that was banks. We had some of our own money and some private money as we went through that mine field of the recession there and came out on the other side and pretty good. I think that a lot of people will tell you that a lot of the experts out there, I think, would tell you that it's not a good thing to be starting in a down market. I probably couldn't agree with more on that, more is just having a plan as you go through that down market. When we started, we saw the recession coming in and the banks pulling back, which we never were, even in the beginning, we didn't rely on the banks a whole lot. We had raised some other private funds. Brett, any thoughts on a couple of those things as we get started here? Kevin Hommel: I'll jump in on that one, Kent. I think if you have a good, you said the word plan, and if you have a good enough plan, I'm not really sure it matters when you get started. It's really more about when you plan to exit. Our clients usually have a longer term strategy, which, I think, Brett was the one that said in episode 1, you're letting a renter pay the house down for you, pay the mortgage off for you. As long as you're not planning on trying to sell when the market does swing, I'm not really that there's as big a risk of trying to figure out where the market it. Just get in, get the property finished, get it occupied, collect that rent for years and years and years. Pay that mortgage down, save a little bit on the side for when you have the other things you just talked about, interest expense, taxes, the insurance goes up like we saw this year, given last year's national disasters and all of that stuff. I think it comes back to that plan you talked about. Kent Clothier: Very good. I'm going to get Brett to talk to us a little bit about buying here because one of the things he's responsible for is okaying all the purchases that we make. Of course, that comes back to the price, that comes back to the timing, that comes back to the location, some of the things that he has to keep in mind with a team that we have out there over two or three cities buying properties each and every day. Brett, talk for a second about the pricing and the location and a little bit about the timing of purchases as a new person would venture into this real estate investor market. Brett Clothier: As Kevin said, as a real estate investor, you got to be looking at what your goal is when you go to buy real estate. For me, personally, it's accumulation of assets. As Kevin said, I'm not really worried about anything else other than getting in, getting the property owned, getting it financed and getting a tenant in there that's going to pay down that note for me. At the end of the day, I'm not looking at the cash flow that I'm trying to make or the return that I'm trying to make. I'm trying to accumulate a collection of assets that, one day, are hopefully worth millions and millions of dollars. My lifespan on that is a lot longer than other people's because I'm a little bit younger, only being 33. Somebody who is 50, 60, 70 that's just getting into real estate, their time frame may be a little different. For me, that's what my goal is. I think that's important for somebody to start out. First of all, you got to figure your why, why you're even buying in the first place. A lot of people don't even know. If you don't know, I would suggest don't even start. We have some people that they may go read a course or read a book, go to a seminar, download a course, they just think they need to buy and they don't really know what the purpose is. Then, a year later, they spent all their savings. They've bought all these houses and they're in over their head and they shouldn't be a real estate investor in the first place. For me, when talking to people, it's you got to figure out your why. Why you're in this, why you're doing what you're doing. Again, as we discussed last week, whether you go active or passive. If you go active, you got to look at areas, different socio-economic factors in certain cities. Then, if you're a turn-key company, as I said last week, you got to go get on the ground, go inspect what you expect and make sure you know who you're working with. Kent Clothier: Very good, Kevin, you want to pile on that anywhere? Kevin Hommel: I think, Brett, you have 45 properties now? Kevin Hommel: And one of the things I know I've heard you speak about your portfolio enough that your plan is just to have those become debt free as soon as possible. You used leverage to get them, but you're also using the excess cash flow to pay down that debt much more quickly than just riding out a 30 year mortgage on those. That's part of the plan, as well, is you want that to throw off some amount of income and wealth for you at the end of some defined time period. I think that's key to one of the things Brett said, if that's your strategy is to build a portfolio, define your time frame not only for your exit, but also how quickly or far down the road you can push needing the income from those properties. I think that's going to be one of the major factors. Kent Clothier: Let's say that you were going to start your own portfolio passively. I think it's important that you research companies that would do that for you that have a turn key program, which would include helping you locate the property, the renovation process, and having the house renovated, and, of course, managing it for you. That's really what the passive real estate side is. Of course, you need to, whatever market you decide to buy in, be looking at the companies in that market. One, the passive real estate investor company. Two, do they own the property management company. Three, how successful have they been in the property management business. Your list just goes on and on with things of due diligence that you need to do, especially if you are going to build a portfolio of one, five, ten houses. What are some of the policies and procedures of the property management company on serving you as a passive investor? How much communication are they going to have with you? How quick are they going to get you paid? How do they handle the maintenance? Do you handle your own taxes? Do you handle your own insurance? Some of the things that you have to get involved with as you get out there and buying your first property or whatever number it is. You have to do a lot of due diligence, a lot of homework. I know in our office, we have visitors all the time that come here to see us, to sit down with us, to talk to our people, to check all the boxes and see if we're really who we say we are. They want to meet our team, they want to see the operation. They want to talk about houses and locations and property management and customer service and maintenance, all the things that we can do for them. Things that we can't do for them, to make their investment exactly what they thought it was going to be. As you get out there and you take a look at becoming a passive real estate investor, there's a lot of boxes that you have to check before jump out there and buy that first house. We would tell you that whether you're buying from us or anybody else, do your homework, no matter what city you're in. Kevin said something really important a minute ago. Know what your plan is, know what your exit strategy is, know what your expectations are, and how all that's going to come to fruition for you over a year, two years, or five years. Kevin Hommel: On top of that, you said earlier, one, three, five, ten whatever the, I think we should probably take a second to scare people off of one. One is a disaster. One gets you, and I know I've heard Chris say this so many times, you're either extremely happy or you're miserable depending on what's going on with that one house. You really do, for a long term strategy, need to have a plan to build a portfolio so you absorb risk, especially with a company like ours where you have five, six, seven markets. I don't think we fully disclosed on the podcast yet where the next cities are, but our clients know we're going to other cities. Keeping your activity with one company, but spread around to multiple markets can you spread that risk around, too. The risk of one house going vacant when you own one is worse than the risk of one house going vacant when you own five. Kent Clothier: We just changed, recently, in the last 60 days, 90 days, where we don't sell one house to an investor anymore. They have to be able to show that they have the wherewithal to buy two houses, preferably three houses, to at least get started. Today, we have probably about 300 investors that own more than five houses. That's how you build wealth over time. Again, caution to everybody that no part of this real estate is get rich quick. It's build wealth over time. You'll have more successes than you do failures, but you will things that won't go exactly right on anything you buy, whether you get into a stock market or you get into real estate. There's always things that might not go exactly as planned. Brett, thoughts on the one house versus two houses? I know you have 45, thoughts on that? Brett Clothier: I just think it goes back to people have to do their homework and have to get educated. They have to realize that real estate investing, even if you invest passively, is not something you can do part time. It takes a lot of time, energy and effort from the education to go in and meet people, to evaluating the deals that you're being sent, to the closing process, to, with our company, answering the phone each month and talking to the customer service representative so you can be abreast of what's going on with your property and not left in the dark. I think too many people out there get sucked into these schemes and companies out there that tell you that it's going to be easy and you don't have to do a thing. And then they look up, and they buy a property that's not rehabbed, it's in a war zone, they didn't realize where it was. To me, it just goes back to education. Kevin Hommel: Hey Brett, take yourself, so you own 45. You're a part owner of this company. Obviously, real estate and property management. Take yourself and put yourself in the shoes of someone just getting started. Let's say it's not in one of our markets. Let's say they're not going to be working with Memphis Invest. What advice would you give the brand new investor on how to vet out the property, how to vet out the management company? Obviously, both being two major factors in their success. Brett Clothier: Like I said last week, the first thing I would do is I would go to whatever city that is, even if it's in your backyard, or whether it's out of town. Make that investment of your time and your money to go out there, spend some time with your boots on the ground. Don't rely on what other people tell you or what you read on the website or on the magazine or newspapers. You have to go out there and you have to see it for yourself and you have to get a comfort level of the people that you're working with. At the end of the day, you're going to be writing a really big check and somebody else is going to be doing all the work for you, most likely. To me, you have to go meet the person. You have to do your due diligence. Most of our investors get home inspections. I definitely would do that. And any other type of homework that I could on the property, I would. I wouldn't simply do one quick google search and do it. I would want to do a lot. Kent Clothier: We can't talk enough about, and we have a lot of investors with us that have never seen their property. But we built up a reputation over the last 10 or 15 years and we invite people to come in and look at their property before they buy it, certainly. After they buy it, which they still do, Brett used the word inspect what you expect a few minutes ago. It's probably so important that you take a look at what you're buying that you know the city, you know the rent ratio of the population there, how many renters, how many buyers, what's going on in the city, are the rents going to be able to go up, how many years of a lease did they sign, is there an automatic renewal on the property, how does that property management company handle move outs, how do they handle renewals. There is a lot of questions, do they do timely inspections of your property? Some property managements do, some don't. We don't do a whole of that. There's a lot of questions that, as you get into the real estate market as a new investor, once you get passed securing your funds and make the commitment to go forward and you line up a line of credit or financing, or whatever you're doing, and then you start the process of taking a look at it a passive company and a property management company in the city, and then you get to the location and you start looking at the structure and the property, home inspection, Kevin? Kevin Hommel: It's interesting that that's part of Brett's answer is that he would go and you followed up exactly what I was about to say. For those who don't know, part of my responsibility is raising the money that we use to operate our company, managing that money with a team here in the office. I talk to a lot of bankers. I meet a lot of private investors that want to lend money. That's the one thing that they're the most shocked about when I tell them that less than 50 percent have probably come to actually se their house that they own that we manage. It took us a long time to achieve that. I don't know, maybe this is a good question for you, Kent. Early on, I would imagine most people wanted to touch it and feel it early on until they figured out these guys are legit and they're doing it the right way. Then that word starts to spread. How far into the game was that where people just said "Hey"? Kent Clothier: We really didn't even realize it, probably quite frankly. We got into three or four years and then realized that we were selling a lot of properties to people at when we travel to New York or LA or to Dallas and we have an event even here at the Embassy Suite, we go over here and sell 30 properties. At one time, we were doing bus tours and then we kind of pulled back as we earned the opportunity to sell properties to people. We earned their trust and they realized that our reputation, credibility and integrity are the most important things to us. And that we were going to be a good partner with them and we were going to value their asset and we were going to take care of it and we were passionate about protecting the investor and doing what's right for them. To this day, we still have those beliefs. That's embedded in our culture that we are going to do the right thing. Our number one interest is the success of the real estate investor. And maybe, other companies are out there that are like that but I don't know if anybody, a lot of people talk about it, I think we walk the walk on that. We want to do what's best for them. We want to do what's best for our vendors. We want to do what's best for our employees. We want to do what's best for our residents. We're really passionate about that as from a real estate investment company. Kevin Hommel: If you're another company like us out there listening, early on it was a mix of us going to them in the markets where they are, the clients coming to us, we doing events here. There was some sales at the original events we do, now there's no sales. It's all education. It's all qualifying. That's been a shift that we've had over the last few years. But I remember, I don't if it was Chris or you that said on the last one, there's a lot of people out there that will just say they're doing it. And so what you do, that I doubt anybody else out there has the guts to do, is they put prospective clients in the room with existing clients and let them have time to be honest with each other. Kent Clothier: We have no secret. We know we're not perfect but we know we're pretty good and we have room for improvement. Whenever we put our new investors in the room with our existing investors, they're going to talk and we like that. Because, again, we try and thrive on making that experience for our investors nothing but excellent. And that's what we strive for. We just try to do that everyday. Again, we're not perfect. We have things that we can do better every single day. You have to go out there and pick the right venue for you, whatever type of investment you're doing. And again, we talked about, you could start your own real estate company, which we've had people that come in here and talk to us about doing that in other cities. We have investors that come in that want to get started in a company like ours from a passive site, and then we have investors that come in and say, "Hey, I can do this on my own. I can find my own houses, I can renovate my own houses, and I can manage my own houses." Kevin Hommel: I wondered where you were going. Kent Clothier: ... firmly in position for success and have experienced some of the ups and downs of being a real estate investor before you walk off with that good job with all those benefits and vacations and insurance and 401K. Kevin Hommel: But you're certainly not saying don't be willing to get out there and take the risk because that's the beginning of your story. Kent Clothier: Yep, you have to have the vision and ready to accept a challenges and put in the hours and the time to do that. Kevin and Brett, what else on this topic today? Brett Shawn? Kevin Hommel: Good stuff. Just have a good plan, work with good people. If you do those two things, obviously, and if your plan is set up for success, then you should do all right. Kent Clothier: Again, don't hesitate. If you have the entrepreneurial spirit and you want to get out there and you're willing to put in the time, if you're willing to put in the time, then you can be a successful real estate investor. You just have to go back and listen to both of these sessions here. There's a lot of good content in there about before you step out there and things to do. Again, we want to thank you for being part of our episode today. Brett, thank you. Kevin, thank you. Want to remind you that the Experience Matters podcast, you can find us on Memphis Invest dot com. Stitcher, Sound Cloud, and iTunes. We look forward to the next episode. Thank you for joining us today. Have a great day.